AT THE outset of Tom Wolfe’s latest novel, “Back to Blood”, the muscled hero, a 25-year-old Cuban-American cop called Nestor Camacho, seethes when his fat and disdainful Americano (Anglo) colleagues stereotype him as a Cuban. He has never set eyes on the island, he says. His Spanish is poor. At home, his parents’ hatred of Fidel Castro flies over his head. His world revolves around Miami, not Cuba. Unsurprisingly, the book is not universally liked in Miami (it skewers everyone, from Anglos to Cubans to Haitians to Russians). But in at least one respect it is spot on. 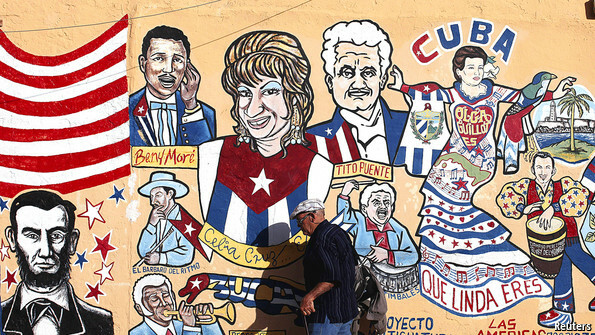 Younger Cuban-Americans are less obsessed with Cuba than their exiled elders. Like other Americans, pollsters say, they now think more pragmatically; Cuba is not the only voting issue that they care about. The laws of both the United States and Cuba have forbidden such money to be treated as investment. But on March 29th Cuba’s parliament approved a new foreign-investment law that for the first time allows Cubans living abroad to invest in some enterprises (provided, according to Rodrigo Malmierca, the foreign-trade minister, they are not part of the “Miami terrorist mafia”). The aim is to raise foreign investment in Cuba to about $2.5 billion a year; currently Cuban economists say the stock is $5 billion at most. The law, which updates a faulty 1995 one, is still patchy, says Pavel Vidal, a Cuban economist living in Colombia. It offers generous tax breaks of eight years for new investments. However, it requires employers to hire workers via state employment agencies that charge (and keep) hard currency, vastly inflating the cost of labour. It enhances the right to establish fully owned foreign businesses, although existing private firms, such as paladares, are still forbidden from taking foreign capital. 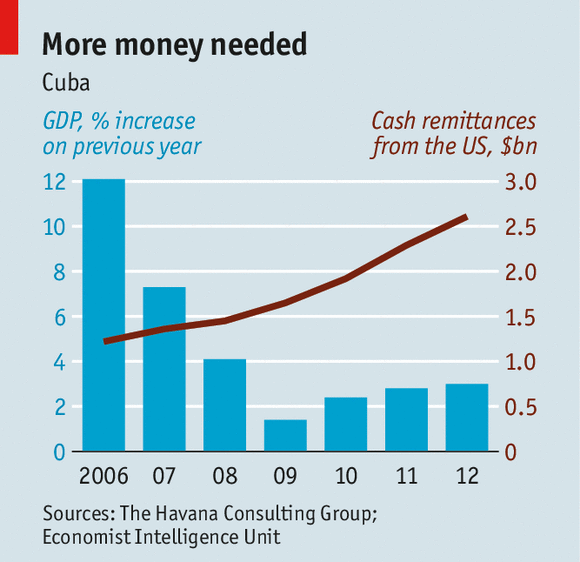 Much, including whether or not Cuban-Americans can invest, will depend on how the government implements the law. “It’s still very discretionary,” Mr Vidal says. Despite their failings, Cuba’s new rules are a reminder of how inflexible United States law remains. Because of the 53-year-old embargo against Cuba, some Cuban-Americans fear they will be left behind as investors from Brazil, China, Russia and Europe move in. Already Tampa, on Florida’s west coast, is vying for a greater share of Cuban business when the embargo is lifted. “Every day we’re missing opportunity,” says Bob Rohrlack, head of the Greater Tampa Chamber of Commerce. Some Miami Cubans have managed to squeeze through cracks in the embargo. Hugo Cancio, who left the island in the Mariel boatlift of 1980, owns a website and magazine, OnCuba, written mostly by Cubans, which plays down repressiveness and plays up commerce and culture. He has a newsroom in Havana but despite his entreaties, American law forbids him from paying its staff. Tony Zamora, a semi-retired Miami lawyer who was jailed in Cuba for taking part in the 1961 Bay of Pigs invasion, has also recast himself as a promoter of investment in the island. After 40 trips to Cuba, he calls the embargo “almost a total failure”. Many Cuban-Americans put their faith in Mr Obama to soften the embargo, even if Congress will not lift it. They note that more than 60% of Miami-Dade County, where they predominate, voted for the president in 2012, many more than in the previous election, even after he eased policy towards Cuba. If Charlie Crist, a Republican-turned-Democrat who is running for a second turn as Florida governor and supports lifting the embargo, wins in November, it will help their cause. Even so, the old guard cares more about keeping the embargo than younger Cuban-Americans do about getting rid of it. Most Cuban-American congressmen in Washington, DC, remain avid backers of it. Mauricio Claver-Carone, who heads a pro-embargo lobby group, argues that all foreign investment still goes to monopolies run by the Castro regime, which helps prop it up. The stakes have been raised by the jailing of Alan Gross, an American citizen convicted in Cuba of smuggling communications equipment to dissidents. Few believe the Obama administration would risk a bold move without his release. The embargo’s days are nonetheless numbered, not least because Raúl Castro, the 82-year-old president, and his brother Fidel, 87, will not live for ever. In the meantime, it increasingly seems like a relic, as outdated as the Castros’ Cuba.